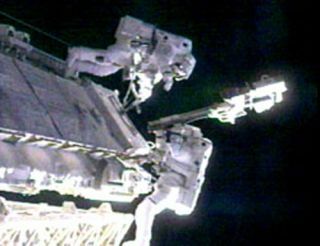 ISS Expedition 12 commander Bill McArthur (right) and flight engineer Valery Tokarev install a new television camera at the end of the Port 1 (P1) truss of the International Space Station (ISS) on Nov. 7, 2005. TheInternational Space Station (ISS) lost some weight and gained a new camera eyeMonday during a spacewalk conducted by its two-astronaut crew. ISS Expedition12 commander Bill McArthur and flight engineer Valery Tokarev moved swiftlythrough the five-hour and 22-minute spacewalk - the first of their six-monthmission - attaching a new television camera and retrieving broken equipmentfrom the space station exterior. "It's agood day in space," said McArthur, who racked up his third career spacewalkwith the extravehicular activity (EVA). "I like it." McArthureven created a new small satellite of sorts when he tossed a defunct floatingpotential probe (FPP) - which measured static electricity buildup around thestation's solar arrays - into space. "How's thatfor a Hail Mary pass?" McArthur asked after hurling the 60-pound (27-kilogram) probeup and aft from the top of the ISS. McArthurand Tokarev - in his EVA debut - wore U.S.-builtspacesuits and left from the station's Quest airlock during their spacewalk,the first time an ISS crew has done so since April 2003due to equipment cooling and contamination problems. McArthurand Tokarev breezed through their spacewalk despite a falsestart early on that pushed them one hour behind schedule. The twoastronauts had already depressurized the airlock's outer compartment andchecked their spacesuits for leaks when a closed vent valve forced them torepressurize the airlock, renter the Quest's inner compartment and open thevalve. The valve is required to be open to empty the airlock of remainingatmosphere, and aid in an emergency repressurization if needed, NASA officialssaid. By 10:32a.m. EST (1532 GMT), McArthur and Tokarev officially began the EVA and were promptly captivated by the view of Earth. "That is beautiful, ohman," McArthur said of the Earth as he and Tokarev made their way towardtheir first worksite. "Oh, look at theplanet," Tokarev added. McArthur and Tokarev leftthe space station empty during their spacewalk, marking the ninth time theorbital lab has been devoid of human crew during an EVA. Normally, a thirdcrewmember watches over spacewalks from within the ISS, but station crews havebeen limitedto two astronauts since the 2003 Columbia accident. All eight of the previoustwo-person spacewalks were conducted in Russian-built Orlanspacesuits, while ISS flight controllers watched over many of the station'ssystems. Despitetheir late start, McArthur and Tokarev managed to work quickly and make upthe time they lost. Theastronauts swiftly installed a new camera the end of the station's portsidetruss - which will provide vital views during future construction spacewalks -then hauled themselves, hand-over-hand, to the station's starboard truss. Therethey removed a faulty electronics box, dubbed a rotary joint motor controller(RJMC), for one of the space station's radiators. The box isdue to return to Earth aboard the space shuttle Discovery's STS-121flight so engineers can determine why it failed and improve later versions. TheExpedition 12 crew also scaled to the space station's highest point - its solararray-laden P6 truss - where McArthur removed the floating potential probe andcast it into space. Spacewalkingastronauts during the recent STS-114shuttle mission to the ISS found that parts of the probe had backed out,prompting concerns the device might separate entirely and become a debrishazard. The probe was already slated for removal, since ISS engineers doubtedit could withstand the strain during a future construction project to move theentire P6 truss. "It doeslook kind of gnarly," McArthur said after examining the probe, which shouldburn up in the Earth's atmosphere after about 100 days. McArthurand Tokarev also spotted a loose metal washer floating in near formation withthe ISS, presumably shaken loose during their 50-foot (15-meter) ascent up the P6 truss. "It doesnot appear to be a threat," McArthur said. The twospacewalkers concluded their day by replacing a failed circuit breaker used topower a redundant heater aboard the space station's railcar-like Mobile Transporter.The circuit breaker and electronics box retrieval were bonus tasks added to thespacewalk only if time allowed. The camera installation and RJMC tasks werealso pick-up procedures left incomplete during the final STS-114spacewalk. "It ispossible to do more work," Tokarev said, referring to the bonus tasks. With theconclusion of today's spacewalk, McArthur has accrued 18 hours and 38 minutesof EVA work, while Tokarev has five hours and 22 minutes under his belt. "Valery'sgood," McArthur said during the spacewalk as Tokarev swapped out his tethers. "It's like he's done this forever." The twoastronauts are scheduled to again step outside the space station'sRussian-built Pirs docking compartment - this time clad in Russian Orlanspacesuits - on Dec. 7. However, McArthur and Tokarev will also leave the ISSon Nov. 18 aboard their Russian SoyuzTMA-7 spacecraft, during a relocation flight from the Pirs compartment. Theastronauts are slated to move the vehicle to a docking berth at the Zaryacontrol module to free up Pirs for the upcoming spacewalk. Thesuccessful spacewalk marked the 63rd EVA dedicated to themaintenance or construction of the ISS, the 35th to be staged from the stationitself, and the 18th to begin at the Quest airlock. Astronauts havespent a total of 378 hours and 40 minutes working out the space station'sexterior, which McArthur said was a sight to behold. "You know,from the outside, this is a darn impressive spacecraft," McArthur said duringthe spacewalk.